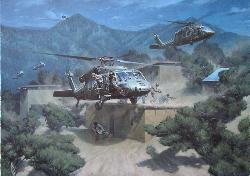 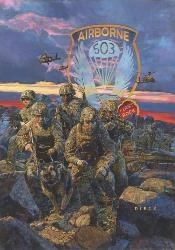 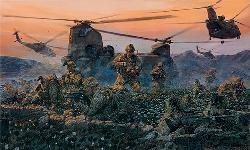 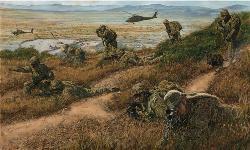 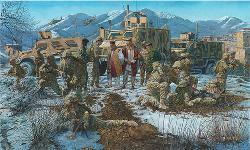 This painting by James Dietz commemorates the intrepid spirit of the 1st Brigade Warriors and depicts a Security Force Advise and Assist Team at an Objective Rally Point with an Afghan Security Force element (Afghan Army, Uniformed Police, Local Police and Anti-Taliban) as they are about to pass through and take the fight to the enemy. 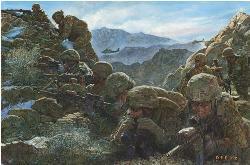 Here The Warriors enabled the Afghan Security Forces to take the lead, setting conditions for the transition of Security in Ghazni-South to the Joint Afghan Army, Police, and Governance with the strong support of the people. 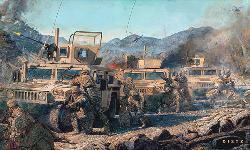 In 2002, elements of the 1st Brigade, 10th Mountain Division played a critical role in the initial stages of Operation Enduring Freedom as a part of the United States' initial response to the attacks on 9/11. 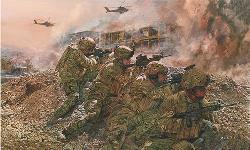 Later, the Warrior Brigade deployed to Eastern Afghanistan in 2003-2004 and Northern Afghanistan in 2010-2011. 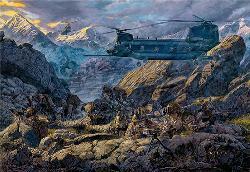 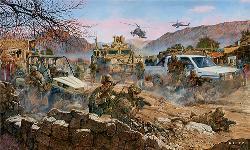 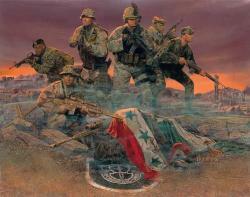 This print depicts the Warrior Brigade executing Advise and Assist Operations in Ghazni Province, Eastern Afghanistan in 2013 to help write one of the final chapters as Operation Enduring Freedom comes to an end. 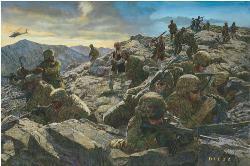 In order to accomplish its mission of enabling the Afghan National Security Forces to stand up and secure Ghazni Province, the Warrior Brigade transformed itself into a Security Force Assistance Brigade with fourteen Security Force Advise and Assist Teams at its core. 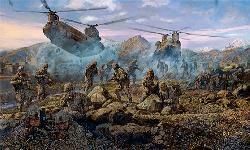 Upon arriving in Afghanistan, the Warriors embraced their Joint, Inter-Agency, Afghan, and Polish partners in Ghazni creating a truly Cross-Functional Team, focused on accomplishing the Regional Commander's Intent. By leveraging the capabilities of all these partners, Cross-Functional Team Warrior, enabled the Afghan National Security Forces to stand up, fight and win, confronting the enemies of Afghanistan and securing the people of Ghazni. 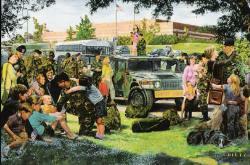 Image Size: 25" x 16.5" Overall Size: 31" x 23"